This homily was given by Archimandrite Philaret (Drozdov), the future Metropolitan Philaret of Moscow, in the St. Alexander Nevsky Lavra in St. Petersburg on Holy Friday, 1816. Shall some speak these days of love? Shall they now speak, when the fruit of enmity has ripened in the vineyard of the Beloved; when the earth trembles at the horror, hearts of stone are rent asunder, and the eye of heaven is darkened with deep indignation? Shall they now speak of love for the world, when also the Son of God, suffering in the world, is abandoned bereft of comfort, and His prayerful cry, My God, my God, why hast Thou forsaken me? (Mt. 27:46), is left without response? True, O Christians! This day is a day of enmity and horror, a day of wrath and vengeance. But if that is so, then what will become of us when the earth is no longer firm beneath our feet and the heavens are no longer calm above us? Whither shall we run from the quaking earth? How shall we come out from under the threatening sky? Look with all diligence upon Golgotha: there also, where is seen the concentration of all affliction, you will discover your refuge. At that time, when The earth shook and was made to tremble, and the foundations of the mountains were troubled and were shaken, because God was angry with them (Ps. 17:7), do you not see how unshakably stands the tree of the Cross that cannot be uprooted? Then, while even the dead are disturbed in their tombs, do you not see how peacefully the Crucified One rests upon His cross, no matter how they tried to tear from Him His very glory, saying, Come down from the cross; the very dignity of the Son of God, saying, If thou art the Son of God, come down from the cross; and even the very goodness of faith in Him, saying, Let Him come down from the cross, and will shall believe in Him? Thus, let us affirm in our hearts this truth strange and terrible for the world, but joyful for those who believe: that there is nothing in the world more firm than the Cross or more safe than the Crucified One. That is why the horrors of Golgotha are disseminated all over the world—so that seeing safety nowhere we might run straight to Golgotha and throw ourselves at the feet, hide ourselves in wounds, and immerse ourselves in the sufferings of our Crucified Savior. O sun! Why do you hide your face from Him at midday, when the great works of darkness have reached their midnight even under your light, and when the eyes of the All-Seeing are ten thousand times brighter (Sir. 23:18) than yours and see in darkness just as easily in the light the infamy of deicide? So! In your deep indignation the greater instruction might have been impressed upon us; you too hastily closed the visible day of enmity and wrath, that you might lead us to the contemplated day of love and mercy, illuminated by the never-waning light of the three-sunned Divinity. O Christian! Let darkness cover the earth! Let there be gross darkness upon the nations! (Is. 60:1) Arise from fear and perplexity! Shine with faith and hope! Through the darkness shall come thy light (cf. Is. 60:2-3). Go the way that opens to you the veil of mysteries rent in twain; enter the inner Sanctuary of Jesus’ sufferings, leaving behind you the outer court that is given over to the pagans’ derision. What is in the Sanctuary? Nothing but the holy and blessed love of the Father, Son, and Holy Spirit for the sinful and cursed human race. The love of the Father is crucifying. The love of the Son is crucified. The love of the Holy Spirit is the triumphant power of the Cross. Of this love, O Christian, allow us to keep a certain silence before you, inasmuch as it is impossible to speak of it, so much so that even the Word of God was silent on the cross as the only way to perfectly convey it. Let this Word and this love grant us also to keep silence and heed the silence, just as the children of one mother understand each other through the heart, mutually, without words. Thus, who crucifies the Son of God? The soldiers? They are no more than instruments of torment, like the cross and the nails. Pilate? He seems to have exhausted every effort to defend the Rightous One and solemnly announced his unwillingness to take the curse of His blood on himself: He took water, and washed his hands before the multitude, saying, I am innocent of the blood of this just person: see ye to it (Mt. 27:24). The people? How could they seek the blood of the One Whom they sought to enthrone as King? The high priests? The elders? The Pharisees? They admit that they have no authority over anyone’s life: It is not lawful for us to put any man to death (Jn. 18:31). The betrayer [Judas]? He had already witnessed in the temple that he betrayed the innocent blood (Mt. 27:4). The prince of darkness? He could not even take the life of Job; he himself is now condemned and cast out. But who could know the crucifiers better than the Crucified? And what does He say? They know not what they do (Lk. 23:24). Caiaphas touched upon the true reason when he said, It is expedient for us, that one man should die for the people, and that the whole nation perish not: just the same—this spake he not of himself: but being high priest that year (Jn. 11:50, 51). He sounded forth like a cymbal whose duty it was to announce that day for the church, but he himself did not understand his own good tidings. Thus, what they did not want, could not do, and did not know was performed before the whole world by those very ones who did not want it, could not do it, and did not know it. Incidentally, this does not mean that there were no guilty parties to the murder of the Innocent! No! Who was not able if he only wished it to understand what even the despairing Judas understood and preached? However, Had they known it, they would not have crucified the Lord of glory (1 Cor. 2:8). We must note here what a contemptible spider’s web all the visible causes weave to make up the great event on Golgotha. How is it that this web was not torn apart in its earliest threads, either from the breath of God’s wrath, or even from the wind of human vanity? Who bound the lion of Judah with it? How was done that which they did not want, were not able, and did not know to do, and which would have been so easy to understand and prevent? No! “The blasphemers of Golgotha knew no more what they said than the crucifiers knew what they did; in fact” God’s greatness is not mocked here by humans, but rather God’s Providence makes sport of human frenzy, “without violating their freedom” inducing them to serve its most exalted wisdom. Deceitful slaves are not deceiving the Lord, but the All-Good Father is not sparing the Son, so that the deceitful slaves would not perish. Earthly enmity does not wound heavenly love—heavenly love is hidden in earthly enmity, so that by the death of love it might kill enmity and spread the light and life of love through the darkness of this vale of death. For God so loved the world, that he gave his only begotten Son, that whosoever believeth in him should not perish, but have everlasting life (Jn. 3:16). 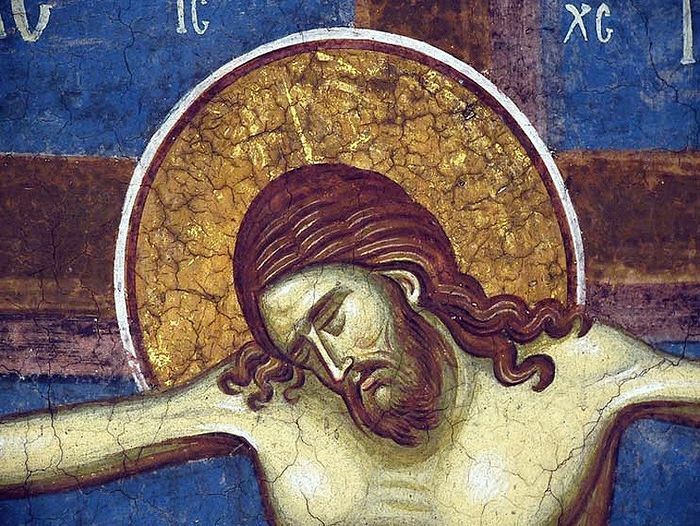 It would seem that when we delve into the mystery of the crucifixion and perceive in the sufferings of the Son of God the will of His Father, we are more apt to feel the terribleness of His righteous judgment than the sweetness of His love. However this should assure us not of the absence of that love itself, but only of our inability and unreadiness to accept what it suggests. He that feareth is not made perfect in love (1 Jn. 4:18), says the disciple of love. Let us cleanse and broaden our eye with love, and where it has been mixed with the fear of God’s judgment, let us delight in the vision of God’s love. God is love (1 Jn. 4:8), says that very contemplator of love. God is love in essence and the very essence of love. All of His qualities are the vestments of love; all His actions are expressions of love. In it dwells His omnipotence in all its fullness; it is His truth, when it brings into being its beloved; it is His wisdom, when it establishes what exists or has its being according to the law of truth; it is His goodness, when He wisely bestows His true gifts; and finally, it is His justice, when the degrees and kinds of gifts either sent down or withheld are measured in wisdom and goodness, for the sake of highest good of all His creation. Come nigh and examine the terrible face of God’s justice, and you will precisely recognize in it the meek gaze of God’s love. With his sin, man walled himself off from the inherent, ever-existing source of God’s love; and this love arms itself with truth and judgment. For what reason? In order to destroy this stronghold of separation. But no matter how an insignificant being, the sinner, might irreparably be crushed under the blows of purifying Justice like a potter’s vessel, the unfathomable Lover of souls sends His Love one-in-essence; that is, His only-begotten Son, so that upholding all things by the word of His power (Heb. 1:3), by taking on Himself our flesh without the sin, He might carry also the burden of our infirmities and the weight of justice inexorably coming upon us, He alone overcoming the arrows of wrath aimed at all mankind, and might in His wounds on the Cross reveal the unshielded sources of mercy and love, which are there to quench the thirst of the once cursed earth with benedictions, life, and blessedness. For God so loved the world (Jn. 3:16). But if the Heavenly Father out of love for the world gave His only-begotten Son, then likewise the Son out of love for the world gives Himself; and as love crucifies, so is love also crucified. For although the Son can do nothing of Himself (John 5:19), neither can He do anything contradictory to Himself. He does not seek His own will (cf. Jn. 5:31), because He is the eternal Heir and Possessor of His Father’s will. He abides in His love, but in that love He Himself receives everything that God loves in His love, as he says: As the Father hath loved me, so have I loved you (cf. Jn. 15:9-10). Thus does the love of the Heavenly Father, through the Son, spread to the world: The love of the Son of God, one in essence with the Father, also ascends to the Heavenly Father, and descends to the world. Let those who have eyes see this most profound foundation and original, inner formation of the cross, formed from the love of the Son of God for His All-Holy Father, and love for man who has sinned—one precluding the other, and one adhering to the other—apparently dividing the oneness, but in truth uniting what was divided. Love for God is zealous for God; love for man has mercy on man. Love for God demands that the law of divine truth be observed; love for man does not forsake even the lawbreaker to perish in his unrighteousness. Love for God strives to defeat the enemy of God. Love for man makes the deity human, that through love for God mankind might be deified. While love for God lifts up the Son of Man from the earth (cf. Jn. 12:32, 34), love for man opens the embrace of the Son of God to those born on earth, and these contradictory strivings of love connect, are dissolved together, are equilibrated, and construct together that wondrous intersection in which the ones asking for Mercy and truth are met together, the righteousness of the deity and peace of mankind have kissed each other, through which the heavenly Truth is sprung out of the earth, and righteousness, no longer a threatening eye, hath looked down from heaven. Yea, for the Lord will give goodness, and our land shall yield her fruit to heaven (Ps. 84:11-13). The Cross of Jesus, formed from the enmity of the Jews and the violence of the pagans, is the earthly image and shadow of this heavenly Cross of love. Without it, the cross not only could hardly hold on itself—even unto death—Him Who holds the life of all the living in His hands, but it could not even have touched the shoulders of the One for Whom twelve legions of angels only awaited His summons to deliver Him. In vain does the dark army raise its weapons to take Him captive and prepare His bonds, for having only the fire of its hatred to light its way, it does not see that He is already captive and bound by His own love, which is stronger than death (Songs 8:6). In vain does the lawless band cry out: We have a law, and by our law he ought to die (Jn. 19:7)—He will die in no other way than by His own law: Greater love hath no man than this, that a man lay down his life for his friends (Jn. 15:13). In vain do the blasphemers repeat: If thou be the Son of God, come down from the cross (Matt. 27:40)—the Son of God precisely by this allows us to recognize Him—that He does not come down from the cross until He has exhausted Himself in His manifold longing of love for His Father, to Whom He finally gives up His spirit, and for mankind, for whom He streams the water of purification and the blood of life. Hereby perceive we the love of God, because he laid down his life for us (1 Jn. 3:16). Dig deeper, O Christians, into this great recognition, not only in word and tongue, or idle hearing, but in spirit and in truth; and you will come finally to, if we might say it thus, a friendship with the cross, so that you will not find any sweeter pleasure than to call out in in the spirit of contemplation with the God-bearer: “My love has been crucified!” (St. Ignatius the God-bearer). The love of God, acting without intermediary in the cross of Jesus, must have undoubtedly imparted divine strength to Him. And how quickly, how abundantly, how immeasurably far does this victory-bearing strength flow from Him! “Except a corn of wheat,” said Jesus Christ about Himself, Except a corn of wheat fall into the ground and die, it abideth alone: but if it die, it bringeth forth much fruit (Jn. 12:24). O, how soon this grain of divine seed, dying on the cross, spreads around itself branches of new life! Look, how yet before the death of Jesus, on the cursed tree, on the lips of the thief does prayer flourish: Remember me, O Lord, when Thou comest into Thy Kingdom! (Lk. 23:42), and this truly paradisal light is that very day transported to God’s paradise. Look at how, together with the quaking earth and the cloven rocks, the hitherto stony heart of the pagan repents and his lips rapidly produce a ripe fruit, confessing to the Savior: Truly this was the Son of God (Matt. 27:54). By what irresistible attraction did “those who left Jesus” when alive gather around His cross and tomb! Even more greatly did victory of the cross manifest itself in Joseph of Arimathea. Knowing Jesus up to then as a prophet and miracle worker, he did not have the courage to reveal himself to His disciples: secretly for fear of the Jews (Jn. 19:38). But when he learned that Jesus had died the “death of one condemned”, the One Ascended from the earth drew him to Himself with such strength that he regarded neither honor nor human fear, and did not waver in revealing his concern for the Crucified One even to the government: He went in boldly unto Pilate, and craved the body of Jesus (Mk. 15:43). And didn’t that grain of death, with the same power, show an extraordinary fruit in those who had long ago rotted in the vineyard of death, and many bodies of the saints which slept arose (Matt. 27:53)? The further the power of the Cross spreads, the more triumphant will be its effect. It concentrates in the one crucified Jesus all authority in heaven and on earth; it allows also those spirits who are in prison to feel the power of His grace-filled realm; it raises Him higher than all the heavens; it sends down from there the Comforter, Who would not have come, had Jesus not gone the way of the Cross and made His path truly royal. Then, the love of God is unhindered and abundantly shed abroad into the thirsting hearts of the faithful by the Holy Spirit (cf. Rom. 5:5), and, disregarding all obstacles, leads the redeemed world by way of ascetic labors of the cross toward the general triumph of enlightenment and glorification. Let the enemies of the cross of Christ build a new cross for His Church—they will only prepare by this a new victory and new glory for it. Let the wise of this age call the preaching of the cross foolishness—it will be foolishness only for those who are perishing. Let the Jews, both ancient and new, request a sign, not noticing the signs that happen before their eyes, and the Greeks seek after their own wisdom of speech where they should actively believe in Divine Wisdom—the true Church will always preach Christ crucified, unto the Jews a stumbling block, and unto the Greeks foolishness, and He will always be for the chosen God, Christ the power of God, and the wisdom of God (1 Cor. 1:18–24). Finally, let those wicked times come when men will not endure sound doctrine; but after their own lusts shall they heap to themselves teachers, having itching ears; And they shall turn away their ears from the truth, and shall be turned unto fables (2 Tim. 4:3–4). After these false teachings they will bring apostasy, and they will wither away love itself with the increase of their lawlessness—in the process of these events, the power of the cross, like a second crucifixion of the Lord, will penetrate with new abundance all mankind and all nature, quake the whole earth, destroy what was firm in it, cast down what was exalted, eclipse what glittered—not so much as vengeance against God’s enemies, who usually prepare their own destruction, as much as to hasten and complete the drawing of everything to the One Ascended from earth. In the same manner also love, like the wise virgins with their ready oil, imperceptibly to the foolish, will abide until the desired Bridegroom appears, and it will be ignited with a sevenfold flame on the wedding day of the lamb; and until heaven and earth and faith and hope have come, and that God may be all in all (1 Cor. 15:28), inasmuch as in all God-bearing hearts will be love, shed abroad in them by the Holy Spirit through the wounds of the cross (Rom. 5:5). The Father of our Lord Jesus Christ, of whom the whole family in heaven and earth is named, That he would grant you, according to the riches of his glory, to be strengthened with might by his Spirit in the inner man; that Christ may dwell in your hearts by faith; that ye, being rooted and grounded in love, may be able to comprehend with all saints what is the breadth, and length, and depth, and height; and to know the love of Christ, which passeth knowledge, that ye might be filled with all the fulness of God (Eph. 3:14–19). Let us incidentally recall that if we are Christians not only in name, but really are, or at least desire to be, true followers of Jesus Christ, then we have also our own cross, according to His commandment: If any man will come after me, let him deny himself, and take up his cross, and follow me (Matt. 16:24). Inasmuch as our cross should be like unto the Cross of Christ, then is it not gladsome to now think that our cross should also consist of love alone? Thus, Christians, this cross, from which those who love the world flee as from a torturer and from which even the cross bearers often groan, although in most cases due to their ignorance, faintheartedness, and inexperience, by which they make heavier the good and easy yoke of Christ, this terrible cross all made of love (what could be more consoling? )—by their own burdens, should consist entirely of love. But let each of us now bring forth our small cross and touch it to the great Cross of Christ, that we might see whether it is like unto the original—for we must know that any cross that is not like unto the Cross of Christ will not raise us up from the earth but will also fall along with us and will burn beneath us as firewood in the flames of Gehenna. Thus, let us behold once more the Cross of the Lord. This love of the Heavenly Father crucifies for us His only-begotten Son. How does our love conform to it? Do we do the works of Abraham (Gen. 22), offering on the altar of God’s love everything we love, without faltering, without leaving anything for ourselves other than hope? This love of the Son of God gives itself over to crucifixion not only by the most holy hand of His Father, but also by the hands of sinners. Has love taught us also this boundless devotion to divine destiny by which we, like Isaac, would always be ready to become a sacrifice—be it for the glory of God, for our own purification, or for the good of our neighbors? This love of God, poured out by the Holy Spirit, fills the mountains and valleys, encompasses time and eternity, that also hardened and moribund enmity against God might be dissolved into life-bearing and blessed love. Is our love also able to conquer evil with good, bless those who curse us, pray for those who crucify us, and not know a single enemy in the whole world, even in a world that has not given us a single friend? We shall not multiply this questioning. Here must the conversation continue—each one’s conscience, which will unfailingly show us now, or sometime, either the woe that awaits the enemies of the cross, or the victory, peace, and glory of those who love it, according to the judgment of the Lamb of God Who was slaughtered on the cross, Blessing, and honour, and glory, and power, be unto him…for ever and ever (Rev. 5:13). Amen. In some editions and in the 1820 and 1821 editions these words are not present. These words are not in some editions. Присносущий, in the text from 1820 and 1821: “приснотекущий”—ever-flowing. In various editions: “from God”. In various editions these words are missing. In various editions and in the 1820 and 1821, continues: “and a murderer”.